The Plum Island light was constructed in Paris, France, in 1889 and served until 2015 when it was replaced with a LED light. Originally invented by Augustine Fresnel in 1822, the lenses were used extensively along European and North American coasts. They ranged in size from first to sixth order (first being the largest). The Plum Island lens is a fourth order lens, a very common size for the Great Lakes. Kurt Fosburg is one of the few in the United States who is licensed to remove, clean and repair Fresnel lenses for the United Stated Coast Guard. 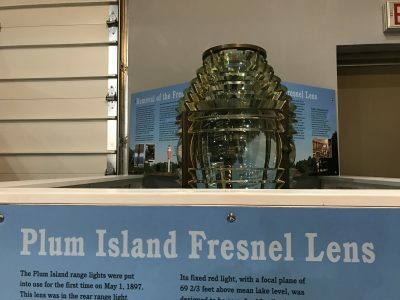 He removed the Plum Island light as well as the Green Bay entry light that is currently on display at the Door County Maritime Museum in Sturgeon Bay.